This music does not fit under the umbrella of any musical genre. It would be a folk song if folk was a stream of consciousness. Add to that certain connotations of contemporary classical formats, and then subtract the mathematics, while also injecting a certain loose balance so characteristic of free improvised music. Yet again it’s just a distant impression, because they use graphical scores. This idiomatic singularity results from the gathering of musicians with different languages. Adriana Sa comes from experimental music and visual arts, having created and performed with custom instruments combining acoustic elements, software and sensor technologies. To Trips is a blues inspired guitarist, the co-founder of the unique and puzzling country-fado-jazz-rock band Dead Combo; and John Klima was a member of the pop group who became The Presidents of the United States of America, many years before their MTV days. 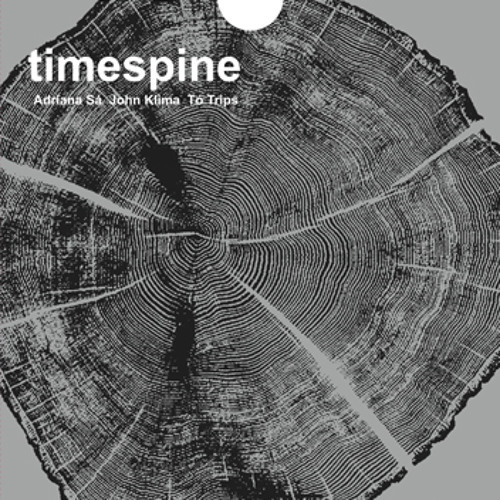 String instruments are at the core of Timespine – a zither, a dobro, and a bass guitar. There are also occasional live sampling and percussion elements. But they service the flow of combining strummed, plucked, percussed, and bowed strings, all tuned unconventionally, at some moments acting like inconsistent drops of rain and at others suggesting the resultant turbulence of three rivers meeting. The river-meeting-music flows soft and slow, and abstract and in a non-linear way, becoming hypnotic and suspending time. This is a music without metrics, and without a clock – only human biological tempos are followed. The end result is a music that simply sounds great, as if Morton Feldman had a Portuguese guitar rather than a piano as the basis of his creativity.